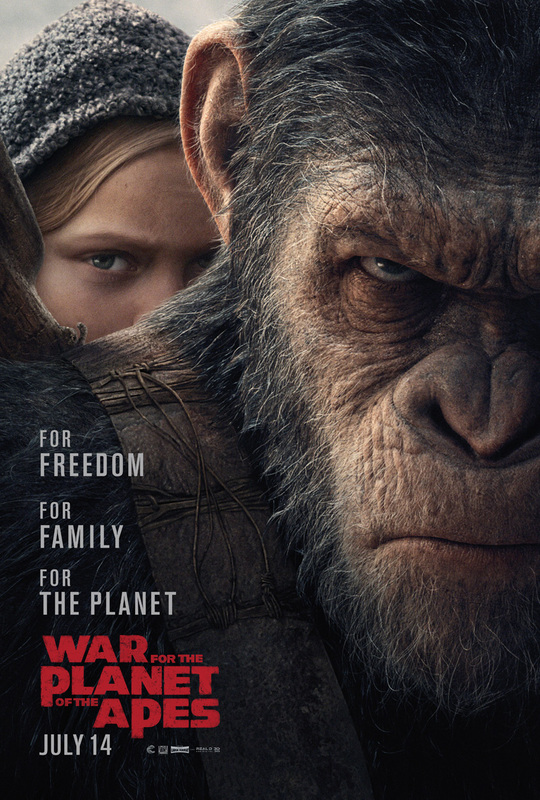 After the human military comes to kill Caesar (Andy Serkis), he must wrestle with the fact that the ever-looming war between apes and humans is finally here. If you are expecting an out-and-out war film here, you’ll be disappointed. Yes, there are soldiers and there’s conflict between the apes and humans but the film is more than that. It’s an intelligent, thoughtful look at humanity and at a group of creatures who just want to be left alone. The conversations between Caesar and The Colonel (Woody Harrelson) are really interesting because they are two smart, capable leaders who have their own kind to protect. It kind of goes without saying but the motion capture and computer work in War for the Planet of the Apes is phenomenal. The actors performing as the apes do incredible work as do the digital artists – you really feel and understand the emotions that play out on these creatures faces. It’s easy to forget that they aren’t really “there”. War for the Planet of the Apes is an incredible film. It builds on the previous two films and adds more depth to the characters we already know and interesting dynamics with new ones. Caesar feels so much older and battle-worn compared to when we last saw him but then there’s a new character like Bad Ape (Steve Zahn) who’s weird quirks brings some much needed humour to the film. Because War for the Planet of the Apes is often a bleak and tough film. The characters, and the audience, go through so much that those moments of humour are needed to break the tension. The relationship between Caesar, fellow chimp Rocket (Terry Notary) and orangutan Maurice (Karin Konoval) is delved into even more in this film. It’s fascinating to see not just Caesar’s growth across the trilogy but theirs, along with the community they’ve built in the woods. War for the Planet of the Apes is a solid, poignant story of hope, conflict and loss. There’s a sense of tension and foreboding throughout the film and it puts your emotions through the wringer. It is an amazing end to a trilogy that just got better and better with each instalment. This trilogy is up there with the best of them. 5/5.